Published in The Times February 28, 2018. 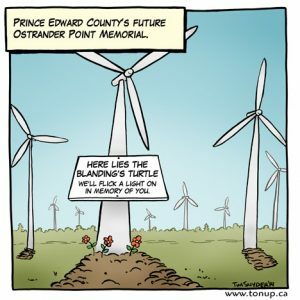 Although they may appeal the appeal, the Prince Edward Field Naturalists have lost their recent court battle to keep industrial wind turbines out of South Marysburgh. This ruling may open the floodgates to hundreds of turbines along the southern shore of the county and the eastern end of Lake Ontario. 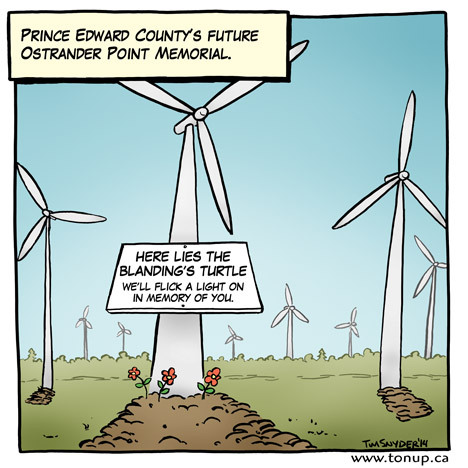 An initial ruling had stopped plans for turbines in the endangered blanding’s turtles’ turf. This cartoon was originally published in The Wellington Times, February 26, 2014. There has been some debate as to the merits of the vote held in South Marysburgh last year, which showed 90% of ballots count for the ‘no turbines’ camp. Detractors point to the fact that there was only a 62% turnout, and there was no undecided option. Still, 90% of 62% of people who actually got off their butts to have a say, said no. 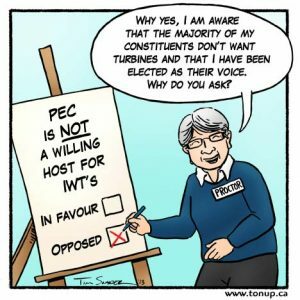 Our local councillor, Barb Proctor, who initially wrote a letter to the Minister of Energy and the Minister of the Environment to support this 90%, now seems to be backing away from the people who elected her by recently voting against a motion to declare the Corporation of the County of Prince Edward is not a ‘willing host’ for IWT’s. 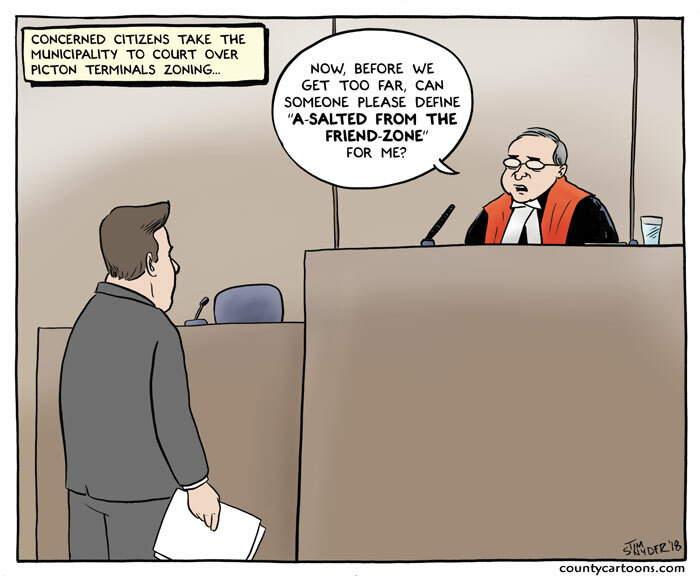 This cartoon was originally published in The Wellington Times, May 1, 2013. It’s a conflicting message. 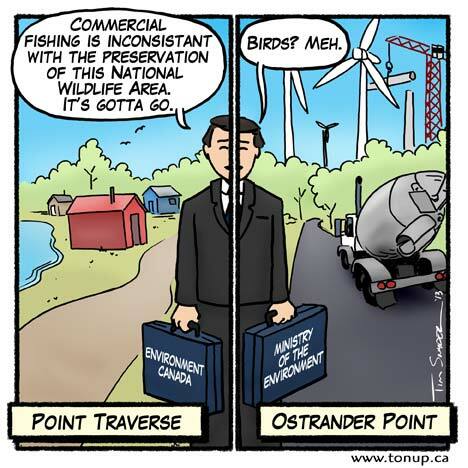 If you have any trouble wading through the bizarre decision making policies of our government, Provincial or Federal, try following the money. This cartoon was originally published in The Wellington Times, March 13, 2013.